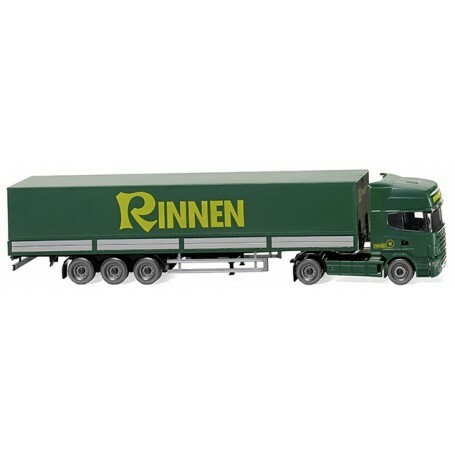  Flatbed tractor-trailer (Scania R420 Topline) "Rinnen"
Flatbed tractor-trailer (Scania R420 Topline) "Rinnen"
Flatbed tractor-trailer (Scania R420 Topline) 'Rinnen'. Tractor unit: driver's cab and lower part of driver's cab with underride protection moss green, glazing topaz. Interior black-grey, steering wheel black. Chassis, Cardan part, exhaust and rear fender black. Fifth wheel plate silver, inserted transparent headlamps. Wheel rims in silver. Drivers' cab with black window edging and windscreen wipers in black, 'Scania' lettering imprinted silver. Company name on side with rapeseed yellow Rinnen logo. Air intake and grille black-grey, anti-glare headlamps imprinted silver. 'R 420' model designation also imprinted silver. Hand-painted door handle. Semi-trailer with moss green flatbed and cover, chassis with rear fenders and axle mounting, stabilizer legs and side underride protection black. Wheel rims in silver. Tarp with rapeseed yellow Rinnen lettering and same lettering front and rear.